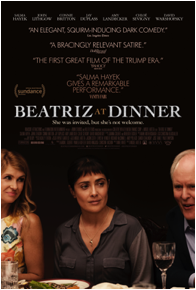 Beatriz (Salma Hayek), an immigrant from a poor town in Mexico, has drawn on her innate kindness to build a career as a health practitioner in Los Angeles. Doug Strutt (John Lithgow) is a cutthroat, self-satisfied billionaire. When these two opposites meet at a dinner party, their worlds collide and neither will ever be the same.